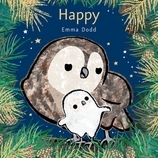 This addition to Emma Dodd’s much-loved sequence of animal books features a tenderly composed rhyming text, heartwarming illustrations, and flurries of foil throughout. Exploring the loving relationship between one little owl and his mommy, this beautifully designed picture book is certain to become a bedtime favorite. 24 / 7 7/8" x 7 7/8"